This 50-year old from Champaign-Urbana scheduled a consultation with Dr. Castillo in our Savoy (Champaign-Urbana) Cosmetic Plastic Surgery Clinic. She wondered if a facelift would improve the changes that had become increasingly bothersome for her over the past few years. 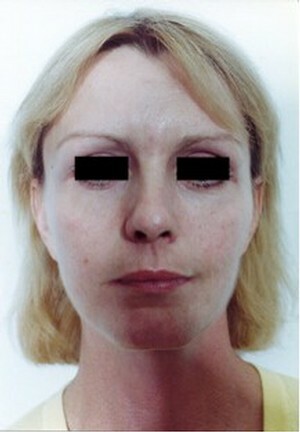 She was very self-conscious of the looseness of tissue around her mouth, along with the neck folds and jowls seen in her lateral (side view) before photos. She also disliked the bags and dark circles underneath her eyelids because people often commented that she looked tired, even though she wasn’t. Although these changes had been present for many years, she was able to camouflage her imperfections with the use of cosmetics until 2-3 years ago. As her existing problems worsened, she became unable to hide her imperfections in spite of her best efforts. 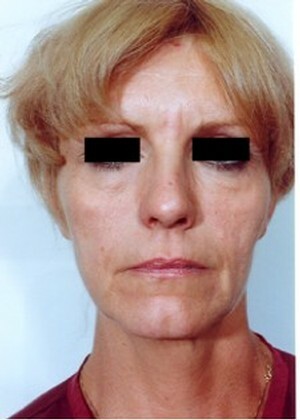 Dr. Castillo explained that it would require a facelift, neck liposuction and lower eyelid surgery to correct the problems that were physically and emotionally affecting this patient. The facelift, neck liposuction and lower lid surgeries were carried out at Champaign-Urbana’s fully accredited Cosmetic Plastic Surgery facility. Dr. Castillo utilized the facelift to tighten the loose, sagging skin around her mouth and throughout the mid face, to create a natural, youthful look. The combination of neck liposuction and the facelift gave this patient the clean, tight jaw line she requested. The dark circles and bags of the lower lids were corrected, giving this patient a well rested, alert and warm appearance. This outpatient procedure was carried out under general anesthesia with resumption of routine home activities a few hours after surgery. Her sutures were removed six days following surgery and she was able to apply cosmetics two days later. She resumed work nine days following surgery. Following surgery, she is very happy to see the clean, tight line of her jaw and defined jaw/neck angle. You can see by looking at her lateral (side view) before and after photos that the looseness and wrinkling of tissue is no longer present. She likes that her lower lids now appear tight, without bagginess or dark circles and is very relieved that people no longer ask if she is tired. She is now able to apply cosmetics with confidence. She is very pleased to still look like herself, only younger and more energetic.